Manhattan’s luxury market through October saw 118 units enter into contract above $4 million, compared with 141 in October of last year, according to Olshan Realty’s latest luxury market report. 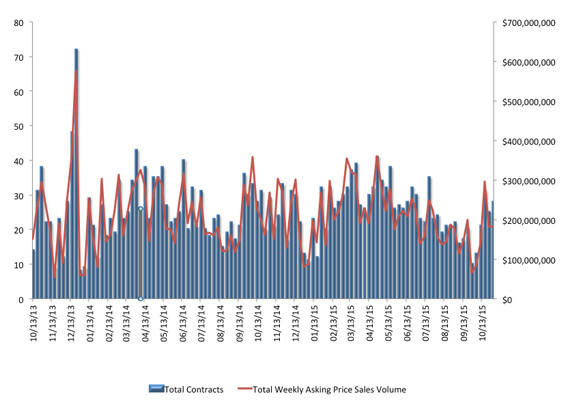 Last week, 28 contracts were signed, with a total asking price volume of $181.6 million. The average asking price this week was $6.5 million and the median asking price was $6.1 million. The average number of days on the market was 239. The top two contracts were townhouses. The No. 1 contract was a modernist house at 32 East 74th Street, which was asking $15.9 million. With 6,500 square feet, the house is 20 feet wide and five stories, with approved plans for an additional floor. It was last purchased for $12 million in 2008, and it has been on and off the market several times since 2010, at one point asking $19.5 million. The living room is on the top floor and is accessible via an elevator.